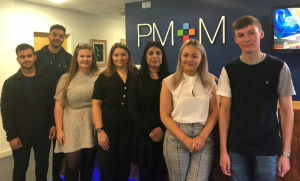 Blackburn, Bury and Burnley based PM+M – the chartered accountancy, business advisory and wealth management group – has welcomed its latest group of young apprentices who will be working in the firm’s Run My Business, Corporate Services, Tax, Wealth Management and Payroll teams. The firm has appointed seven apprentices this year which is one more than in 2017. All seven will be completing a three-year training programme. The new apprentices are: Anya Fallon, James Cocker, Ellie Manley, Rebecca Nuttall, Rebecca Taj, Mohammed Aamir Patel and Zayn Khan. Working across all service areas of the practice, each apprentice will be studying towards a recognised qualification over the next three years, as well as gaining invaluable on the job training.